Please use it, if you like it then spread the world. ICT मे On line गेम्न का होना बहूत जरूरी है. यह मेरा मत है. games से माऊस ऒर की बोर्ड का स्किल विद्यार्थीयोमे अच्छी तरहसे विकसित होता है. मगर हम जिस गेम्स का उपयोग करेंगे वह शैक्षणिक होना बहूत जरूरी है. शैक्षणिक गेम्स इंटरनेट पर बहूत साते मुफ्त मे उपलब्द है. गणित, सायन्स, भाषा विषयोके इंटरनेट पर उअपल्ब्द गेम्स अध्यालन प्रक्रियांको आनंददायी बनायंगे ऎसा मेरा अनुमान है. मेरे पास आज मिती मे १५० से जादा educational Games उपलब्द है.मैने गणीत विषयोंके बहुत साते स्त्रोत धुंड निकाले है. वह आपको यहापर दे रहा हु. http://www.math.com/homeworkhelp/Algebra.html lessons and practice about equations and inequalities. http://www.mathgoodies.com/lessons/toc_vol2.shtm on Circumference and areas of circles. http://www.ies.co.jp/math/java/geo/angle.html exciting problems of angles and parallel lines. Fantastic stuff. Do it yourself! http://www.ies.co.jp/math/java/geo/pythagoras.html an exciting and simple way to learn it! Step 1 - If you visiting any website which has flash !!!! Step2 - go to "Contact Us" page, try to locate email form or email id. Please remove flash videos from your website. You can use webm or ogg videos. Now we do not need to install any third party plugin to watch videos. Today, most browser can play ogg/webm videos. I cannot view you website videos, as I do not use flash player. Please use HTML5 native video support in your website. mandates the curriculum for CS below class 9 (have to check it up). C++ and IP deals with the front-end and back-end connectivity. python-zope.index - Indices for using with catalog like text, field, etc. MHRD must give Tenders to FOSS Companies and avoid .NET programming language. Rs 1.6 crore goes in M$ partner. M/s.Core Projects & Technologies Ltd., Mumbai has been awarded the contract for Design, Development, Training & Maintenance of Web Based Management Information System (MIS) on 21st February 2011 for Rs.1,65,09,986.00 plus applicable taxes. We will now see all the .NET code.. why cannot MHRD force them to use FOSS. be our long term investment, too. language-related needs of Wikimedia projects. this attitude, no matter of location of birth or residence. particular position, sometimes they will. An Appeal to AICTE for asking MoU between Microsoft and AICTE. As you all know that AICTE has refused to provide details MoU between Microsoft and AICTE. Now I have applied for an appeal. (Yesterday, 28 Feb 2011) I went to AICTE office to submit the following appeal. SFLC-India helped me to prepare this appeal. I request engineers of India to create a protest against the MoU. Sub: Appeal under Section 19 of the Right to Information Act, 2005. In response to my application, the CPIO has sent a letter dated January 11, 2011 refusing to provide the information requested, as per Section 8(1) of the RTI Act as the information is coming under commercial confidence, trade secrets or intellectual property. It is submitted that the letter does not specify reasons as to how the disclosure of an agreement entered with an organisation to provide software to students will result in giving information relating to commercial confidence, trade secrets or intellectual property. The CPIO has not given any justification for denying the information sought by the applicant. The letter furnished by the CPIO is not a speaking order and hence the refusal to provide information is not justifiable. An agreement entered with an organisation to provide software to students cannot be withheld from the public citing commercial confidence as a reason. The Central Information Commission has held in Gita Dewan Verma Vs. Additional Secretary (UD) Govt. of NCT Delhi decided on 27.01.2009 that claim of 'commercial confidence' in denying access to agreements between private parties and the masters of the Public authorities,- Citizens, - runs counter to the principles of the Right to Information. The Central Information Commission has held in K.S. 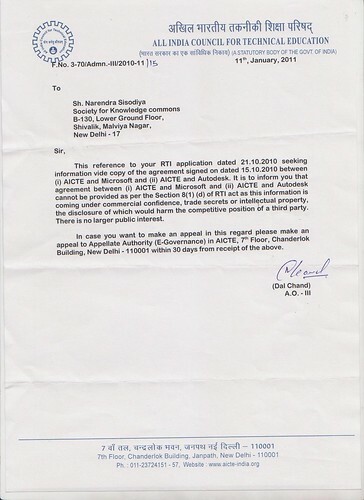 Jasrotia v Hindustan Steelworks Construction Limited dated 18-05-2007 that Memorandum of Understanding between two parties should not be treated as confidential papers. Hence withholding the information sought for from the applicant is unjustifiable and against the provisions of the Right to Information Act, 2005. As per Section 8(1) (d) of the RTI Act, 2005, there shall be no obligation to give any citizen information including commercial confidence, trade secrets or intellectual property, the disclosure of which would harm the competitive position of a third party, unless the competent authority is satisfied that larger public interest warrants the disclosure of such information (emphasis supplied). AICTE is vested with the role of proper planning and co-ordinated development of the technical education system throughout the country. The agreement entered into by AICTE with Microsoft Corp and Autodesk has definite public interest considering the fact that it has a direct bearing on education provided to the student community. The Government of India and many State Governments have undertaken various initiatives to promote Free and Open Source Software (FOSS) in the field of education as well as governance. Recently a letter was sent by Mr. N. K. Sinha, IAS, Additional Secretary (TEL), Department of Higher Education, MHRD to AICTE and Directors/VCs of Central Educational Institutions to explore Open Source Software Solutions before adopting proprietary solutions for their academic, administrative and financial needs. A copy of this letter dated January 12, 2011 is enclosed along with this appeal. In the light of initiatives undertaken by the Government in promoting Free and Open Source Software (FOSS), it is in public interest to disclose details of an agreement entered into by AICTE that could result in promotion of proprietary software. Knowledge Commons is a Non-profit organisation involved in development of Free software like SchoolOS, in collaboration with NCERT, and hence has a public interest in learning the details of such agreements entered into by the AICTE. As the information sought for is in larger public interest, the refusal to provide the information to the applicant is unjustifiable. For the reasons stated above, I request you to quash the decision of the CPIO and to direct that the required information be furnished to the applicant at the earliest. I am enclosing a copy of the application along with this appeal. Although the letter from the CPIO is dated January 11, 2011, it was delivered much later at my office and as I was on sick leave, I received the letter only on February 14, 2011. Considering these facts, I request you to condone the short delay in filing the appeal.